Increase Allen Lapham (1811-1875), self-taught naturalist, and scientist of lasting influence, arrived at frontier Milwaukee in July 1836, when he was 25. One of thirteen children of a New York Quaker family, he worked on canals in New York, Kentucky, and Ohio, where he met Byron Kilbourn. Kilbourn, founder of Kilbourntown (one of three settlements that merged to form Milwaukee) later invited Lapham to Wisconsin to serve as his land agent, help lay out and level streets, and serve as chief engineer of a canal that would link the Milwaukee and Rock Rivers. After the canal project was abandoned in favor of railroads, Lapham turned to the close study of Wisconsin’s geology, botany, archeology, and meteorology. A prolific writer, his 1836 list of plants and shells found in the vicinity of Milwaukee was the first scientific paper published in the Wisconsin Territory. In 1844, he finished the first book published in the territory, A Geographical and Topographical Description of Wisconsin, written to attract immigrants. His most important book, The Antiquities of Wisconsin, was published by the Smithsonian Institution in 1855. Its ninety-two pages of description precede fifty-five plates showing Lapham’s exquisite drawings of Indian effigy mounds, the product of two years of fieldwork. For years, it was the only record of mounds purportedly built in the shapes of lizards, turtles, panthers, birds, and other animals. Most were destroyed over time by plow and development. A careful draftsman, Lapham produced many maps of Wisconsin, its districts, and cities. He published two state geology maps and an isothermal map that showed the influence of Lakes Superior and Michigan on inland weather. His most popular state map appeared for many years in Wisconsin’s Legislative Manual, precursor to the Blue Book. He collected, mounted, and identified thousands of Wisconsin’s native plants, trading specimens with botanists such as Asa Gray of Harvard College and others. He consulted for mining companies in Upper Michigan, Illinois, and Wisconsin, supplied information for several geological surveys, and served two years as Wisconsin State Geologist. As an educator, he donated land to Milwaukee, hoping in vain that it would be used for a high school. He lectured about science to Milwaukee high school students, the Milwaukee Lyceum, a Young Men’s Association that he helped organize, and to classes at the Milwaukee Female Seminary, of which he was a founder. He also helped establish the Wisconsin Historical Society and the Wisconsin Academy of Sciences, Arts and Letters. He lobbied for a national storm warning system that evolved into the National Weather Service. On November 8, 1870, he wrote and distributed the nation’s first official weather forecast. Lapham, his wife Ann (née Alcott) and their children, lived near the Milwaukee River, where he daily monitored weather instruments and where he determined that Lake Michigan had a small tide. He is buried in Milwaukee’s Forest Home cemetery. ^ Milo M. Quaife, “Increase Allen Lapham, First Scholar of Wisconsin,” Wisconsin Magazine of History l, no. l (1917): 9. ^ l. A. Lapham, The Antiquities of Wisconsin as Surveyed and Described (Facsimile of the 1855 Smithsonian Institution edition published by the University of Wisconsin Press in partnership with the University of Wisconsin-Madison Libraries, Madison, Wisconsin, 2001). ^ Louise Phelps Kellogg, “The Origins of Milwaukee College,” Wisconsin Magazine of History IX no. 4 (1926): 392-393. 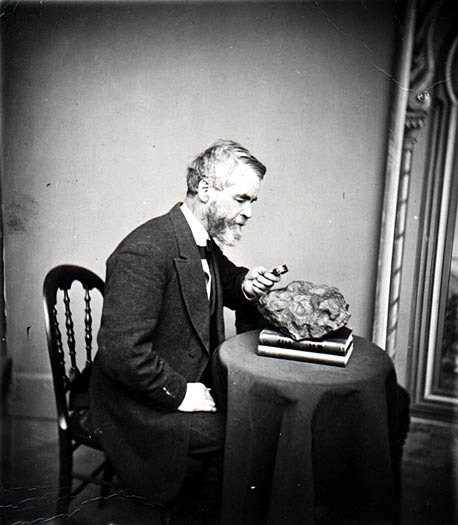 ^ Newton H. Winchell, “Increase Allen Lapham,” American Geologist XIII, no. 1 (1894): 11-12. Bergland, Martha, and Paul G. Hayes. Studying Wisconsin: The Life of Increase Lapham. Madison, WI: Wisconsin Historical Society Press, 2014. Lapham, Increase A. Wisconsin. Reprint of the 1846 edition published by I. A. Hopkins, Milwaukee; first published in 1844 as A Geographical and Topographical Description of Wisconsin. North Stratford, NH: Ayer Company Publishers, Inc., 1999. Lapham, I. A. The Antiquities of Wisconsin as Surveyed and Described. Facsimile of the 1855 edition published by the Smithsonian Institution. Madison, WI: University of Wisconsin Press, 2001.